People like to joke around with Bob Moore. Of course they do. The founder of Bob’s Red Mill has a laugh recognizable from any corner of his store or office. In the days before the company grew to a multi-million dollar, international business, he knew all of his employees and their families, and he figured out pretty quickly how to get a good laugh. Thirty-five years later, at 85, Moore is still running his business. When not at his desk, he strolls the aisles of his store, chatting with customers and employees alike. 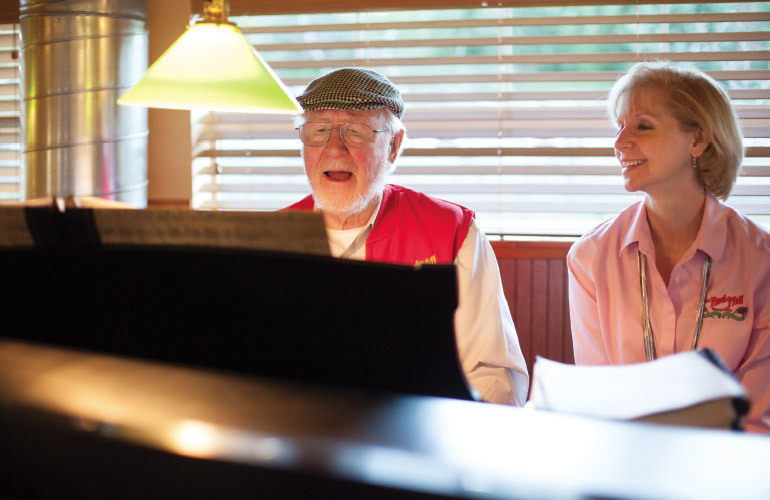 Every Friday, Bob and his assistant, Nancy Garner, sit at the twin baby grand pianos at the café and play – all afternoon. He still enjoys a good laugh, yet he’s still the boss and everyone knows where to draw the line – everyone except Lori Sobelson. She draws her own line. A George Fox student interacts with Moore following a lecture he gave as part of the university's Executive in Residence Day in October 2012. His visit to campus also included a Q&A session with business students and a classroom visit in which he critiqued students’ business plans. From loyal customer for the last 33 years to store manager to director of corporate outreach, Sobelson, a 1997 George Fox University graduate, now regulates and guards millions of dollars in charitable giving for Bob’s Red Mill. She knows the products as well as the miller does himself – and knows how to get a rise out of him and take a hit herself. Moore lets loose with a belly-deep chuckle. Sobelson is like a daughter to this entrepreneur. They acknowledge it, like it, are proud of it. “I say things to him no one else can,” she says. And she slaps his hand if he gets into her quinoa, which he did in front of an audience of several hundred at Oregon State University. “Don’t lift the lid on cooking quinoa,” Sobelson had just instructed attendees of her cooking class. Moore disobeyed and was promptly reprimanded. For his part, Moore has been known to walk on stage with a cup of water, claiming that if he has to work with her, he needs his vodka. Sobelson is like a daughter to this entrepreneur. They acknowledge it, like it, are proud of it. The first time Moore offered Sobelson a job, she declined. “Well, it wasn’t an official offer,” she says. “She had too much education,” he says. Truth was, Sobelson was at George Fox at the time and wanted to stay in school. That didn’t stop her from popping in for lunch at Bob’s Red Mill’s deli – or helping Moore’s wife, Charlee, serve coffee at the deli when the lines went out the door. She loved the mill, loved the product and loved helping out even without a paycheck. All of those positions post-graduation have been at Bob’s Red Mill. In 2003 Moore built the Whole Grain Store and Visitor Center in Milwaukie, Ore. He needed an assistant manager, someone good not only with people but also in the kitchen, who could teach cooking classes at the store. Sobelson had more than a leadership degree to her name, and Moore knew it. 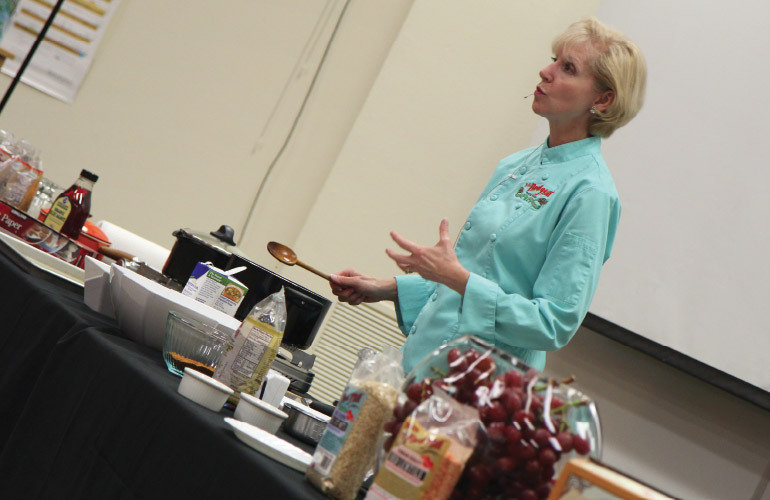 Sobelson, who oversees the Bob’s Red Mill Cooking and Baking School, visited campus in October 2013 to present "Healthy Eating on a Budget," which included a cooking demonstration. She has also taught classes at the Culinary Institute of America in New York in addition to venues around the Northwest. “You can see by her personality . . .” Moore pauses. “After hours of talk, why, she convinced me she was the right person for the job.” Sobelson just laughs and says she tried too hard in the beginning, wanting badly to succeed and make Moore proud. During her eight years as assistant manager at the store, Sobelson developed a cooking school that was open to the public as well as employees. Moore and his wife often attended, and he could not keep quiet. “He used to come to my classes and throw stuff out – see if he could catch me off guard,” Sobelson says. Along the way, Sobelson stopped trying so hard and simply did the hard work that came naturally to her. Whatever Moore tossed to her, she caught and returned – with interest. But these weren’t just jokes; they were ideas and projects. First, attending trade shows with Moore, promoting products and offering seminars on healthy cooking. Then one day it was a new job. Long known for his generosity, Moore made national news in 2009 when he gave his company to his employees through an employee stock ownership plan (ESOP). 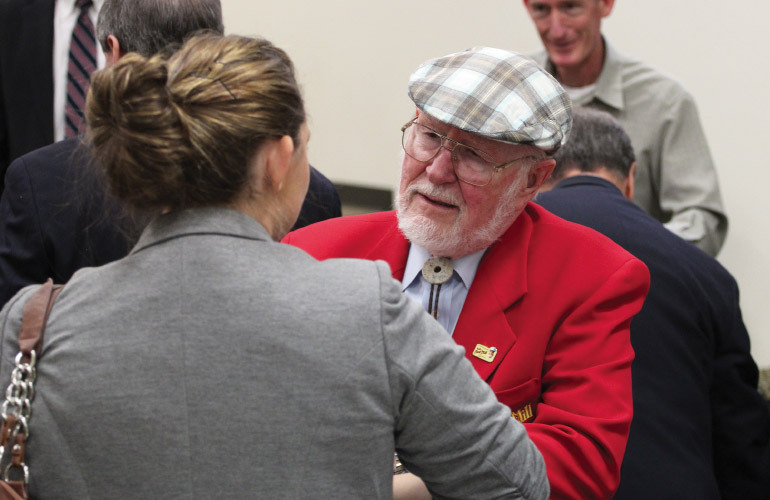 By 2011, Bob’s Red Mill charitable giving had grown to such proportions that it desperately needed dedicated oversight. To Moore, Sobelson was the obvious choice for the new position. “He gave me a title and he said, ‘OK, this is what I need you to do: You figure it out, you create it, and then I’ll let you know if you’re doing it right or not,’” Sobelson says. Creating positions is nothing new to Sobelson; she created the cooking school at Bob’s Red Mill and positions within other companies before that. “ – great responsibility,” she says, completing her sentence. Every Friday afternoon, Moore clears his schedule for some quality time with one of the twin baby grand pianos at his café. Sobelson doesn't play, but has been known to sing along. Not that Sobelson’s responsibilities are paltry even now. Annual product donations average 300,000 pounds. Then there’s the financial contributions she oversees both for Bob’s Red Mill and for Bob and Charlee Moore’s charitable trust, which currently includes a $25 million donation to Oregon Health & Science University (OHSU) to establish the Bob and Charlee Moore Institute for Nutrition and Wellness. In addition to working with recipients on implementing donations, Sobelson constantly researches and responds to new requests for both product and financial donations. Strict guidelines within the program streamline Sobelson’s selections. From there, she determines whether product samples, gift baskets for fundraising, or financial sponsorship is appropriate. “I don’t know anyone – anyone – who would do her job. And I know a lot of people,” Moore says. The laughter and insults of the past hour fade as Moore gets serious about the business of giving. So for the past two years – and for the next 50 if Moore has his way – Sobelson is helping spread it around a little bit. The question itself seemed simple enough: What would you say to someone who struggles to be generous? Moore, founder of Bob’s Red Mill, seems the likely candidate for an answer. Rather than sell his business to fund his future retirement, he gave it to his employees through an employee stock ownership plan. He has donated tens of millions to nutrition research and education, and frequently helps small community nonprofits in his own neighborhood. After an arsonist burned his mill in 1988, Moore wasn’t sure he could start over again. A lifelong entrepreneur, he’d owned four businesses in three decades, worked successfully for other businesses in between and already retired once – until the dream of establishing his second mill lured him into becoming founder and owner once again. Then came the fire. He rebuilt for his employees. They counted on their paychecks to feed their families and put their kids through school. They were loyal to him; he couldn’t walk away. And so he rebuilt, becoming more successful than before. Bob Moore came to Oregon for seminary. He stayed and created his most successful business yet. As an entrepreneur who had bought or built, run and sold three businesses already, 50-year-old Moore had entered his first retirement. It wouldn’t last. By day husband and wife Charlee attended seminary, studying the Bible’s original languages. In the evenings, Bob returned to class to help other students with the material. Between class sessions, the couple strolled the quiet neighborhood streets on the east side of the Willamette with flashcards in hand, memorizing Greek and Hebrew. Moore renovated the mill and re-entered the work force, establishing Moore’s Flour Mill in Milwaukie, Ore., which eventually became the internationally known brand Bob’s Red Mill. As Moore’s business grew, so did George Fox, and in 1996 WES would merge with the university, move to Portland and become George Fox Evangelical Seminary. 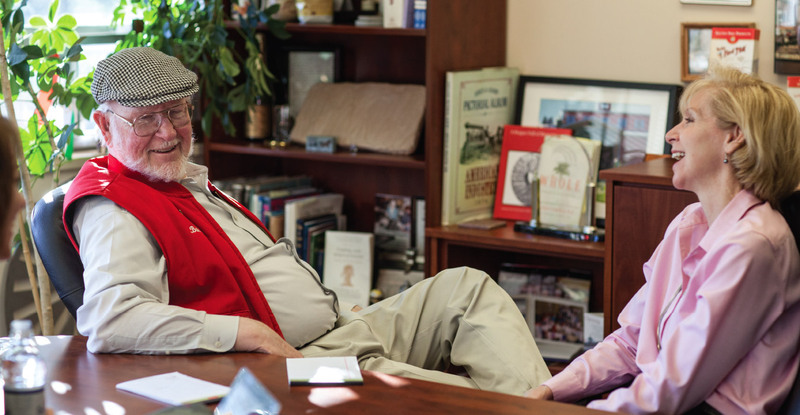 And while Moore never attended a class under the new name, his connection to the university has grown in recent years thanks to common goals of giving back and equipping tomorrow’s Christian business leaders. This March, Bob’s Red Mill partnered with George Fox as a sponsor of the Empty Bowls benefit dinner, which raised funds for specialized speech therapy for art professor and stroke victim Doug Campbell. Earlier, in October 2012, Moore visited campus as part of the College of Business’ Executive in Residence Day to lecture and visit with aspiring entrepreneurs.